This plan didn’t work as intended. I had to come back to the drawing board and rethink/simplify some stuff. I have left everything as-is up to the point of failure incase it’s important to anyone and it really makes no sense to delete it. Below is what I wanted to do and a few of the steps I documented towards this goal, here is where I revisited this project with a much different approach. I would read this first anyway before reading the revisited version. If you don’t try you’ll never know, right? FreeNAS will install just fine on the MS without any modifications and everything seems to work just fine, so i’ll skim over the install and add some detail to the configuration I used. 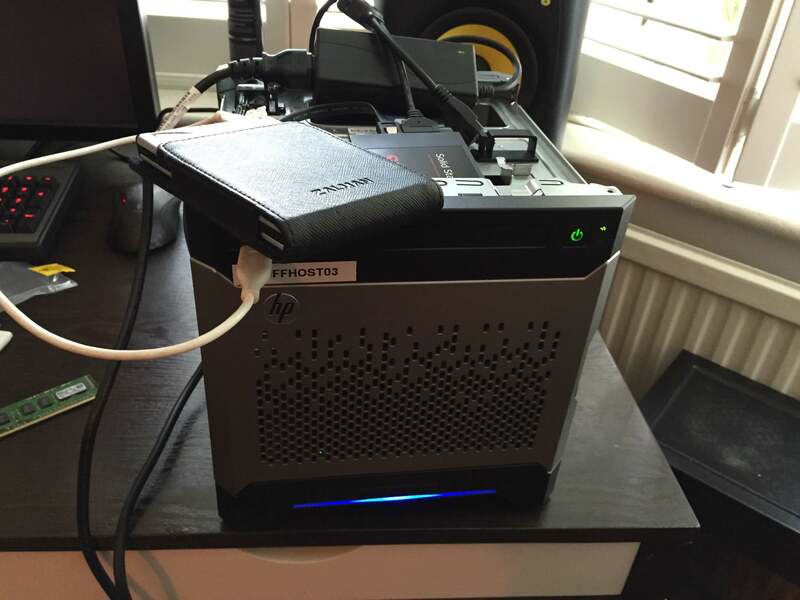 Boot from your chosen installation media using ‘F11’ at bootup and let the FreeNAS installer do it’s thing. Installing ESXI on most machines is relatively easy, and the MicroServer Gen8 is no different, I won’t go into too much detail on the installation/configuration as it’s childsplay. Note: I used iLO to configure all of this as per my last post on this project. iLO standard only allows you to control the machine over the network up to a certain point in the OS bootup and then requires a license to work. I have a license that I put on both of these machines, but you can also just get a 30 day trail of the license for this setup phase of the MS lifetime. 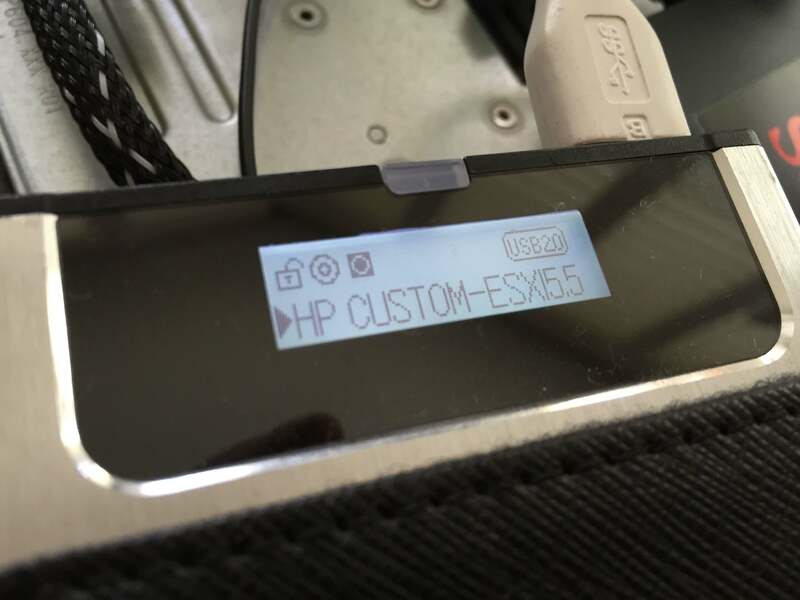 Firstly; get the HP customized ESXI image from here. Once this is downloaded you can either use tools like unetbootin to ‘burn’ the image to a USB drive or if you have a valid iLO license (even a trial one) you can mount the ISO through the iLO console on another machine and still boot from the ISO over the network. Do not try and mount the ISO with the standard iLO license as it will boot and then cut off during the installer bootup. I used my trusty external HDD/ODD emulator, this thing is my #1 tool as I can just throw any number of isos onto this thing and then mount it using the onboard screen and controllers and the device emulates a CD drive to any machine via USB. HellaFuckinUsefull. Turn the thing on, press ‘F11’ to bootup to a boot override mode, select CD/USB ONETIME bootup and let thing ESXI installer bootup. Go through the setup stages, I won’t go into that here but it’s just a next>next>next deal; just insure you select the correct install device, which in my case is the 8GB USB drive inside the system. Once it’s done just remove your installation media and reboot the box. If ESXI doesn’t start to boot go into the BIOS and change the boot order to allow the ESXI source to boot first, I did this in my inital BIOS setup so everything was hunkydory. Once booted up press “F2” to configure ESXI, enter the password you chose at installation and setup networking. It should have gotten an IP from DHCP (if you have DHCP enabled) but I like static addresses for my hypervisors so I used an address I had ready, 10.0.0.184. You can also change the DNS name of the box here too. Exit out of the configuration options and save the config, now leave the box and go over to your main machine. If you’ve never used ESXI before you will need to download the vSphere Client, you can get this by navigating to the IP you chose/was given to the box and install it from there. If you already have the client you just need to open her up, slap in the IP, username (root) and chosen password and connect. I use the web client myself and everything went swimmingly. The following screenshot was taken a little bit after this step so some things have already been configured, it doesn’t really matter but I’m mentioning it to avoid any confusion. 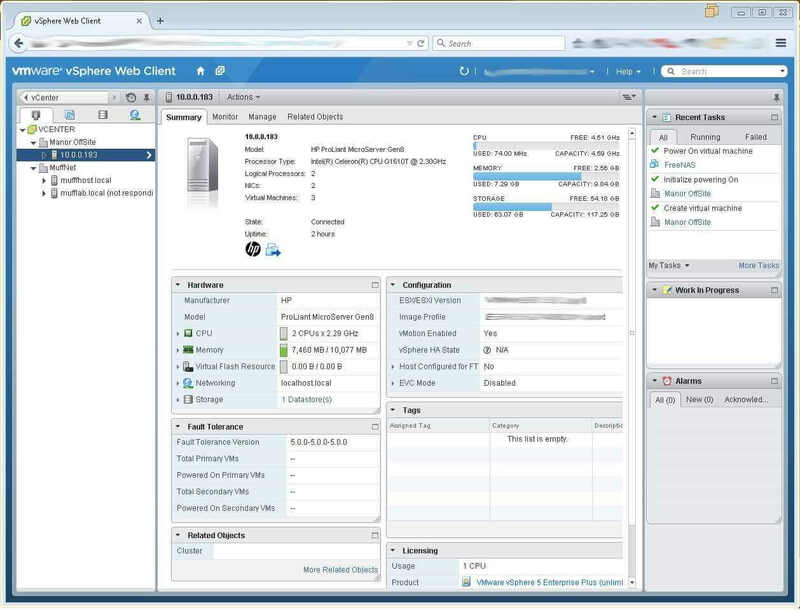 The last thing that you want to do here is to go over to the configuration options of the ESXI host and then add the storage. I just added the SSD/your chosen storage medium as a VMFS5 datastore using all the space available, the name is completely up to you. Oh and add your license; I do this all in vSphere web which applies my unlimited license but you will want to apply it ASAP even though you have 60 days.